It's almost 2013! I thought I would wrap-up the year with a mosaic of my December finishes. This was a pretty good month for me. I had 5 items on my "must do' list and all 5 got done. For more information on any of these finishes, see the 2012 Finishes tab at the top of the screen. 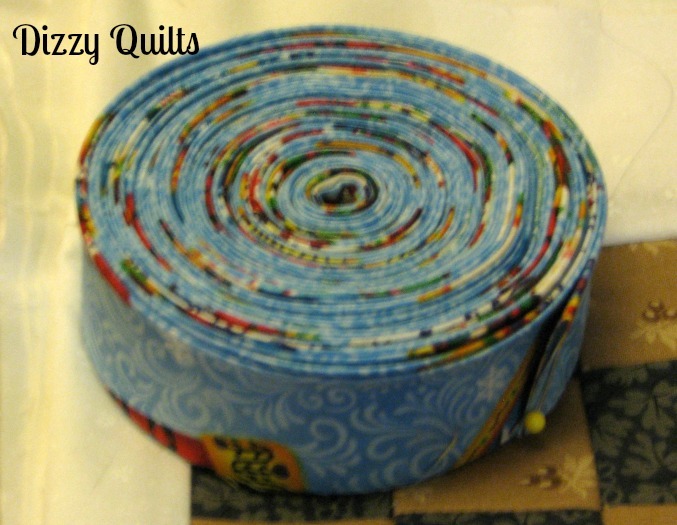 In 2013, I want to try techniques I haven't tried before and I want to quilt every single top in my UFO pile. If I finish one every month, by the end of 2013, I'll have none left. 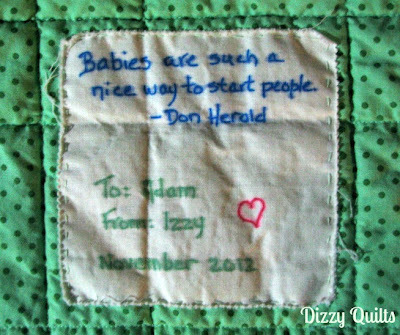 I'm almost done with my last project of 2012 - a baby quilt for a little nephew who was due to come into the world on December 21. 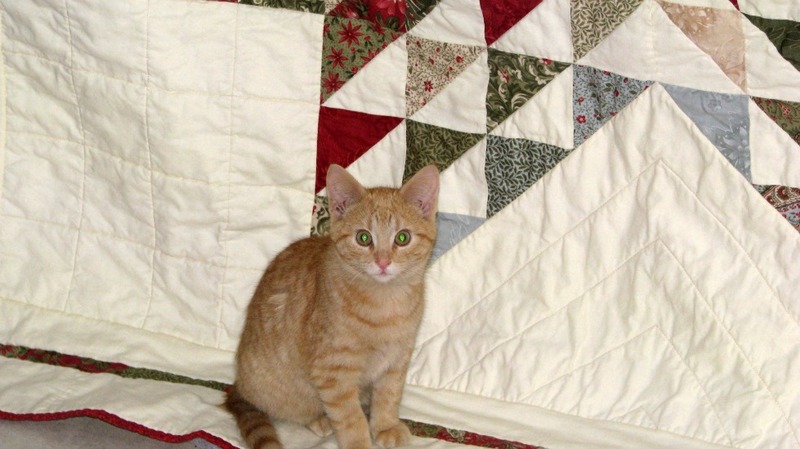 He obviously knew his quilt wasn't quite done - the 21st came and went and we are still waiting. 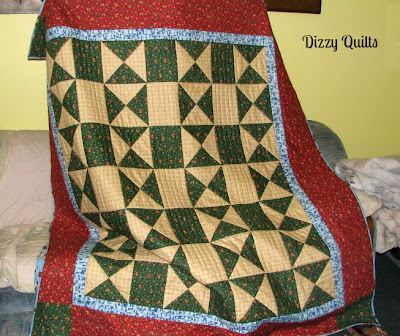 I really needed to find a quick and easy project for this quilt because I was on a very tight deadline so I ordered a kit from the Fat Quarter Shop. The top came together super fast and I love those bright colours. 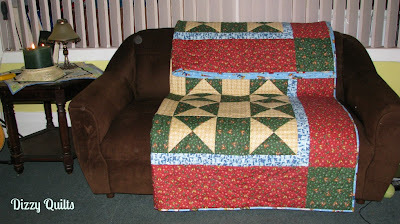 I'll be preparing the quilt sandwich this afternoon and hope to start quilting tomorrow. 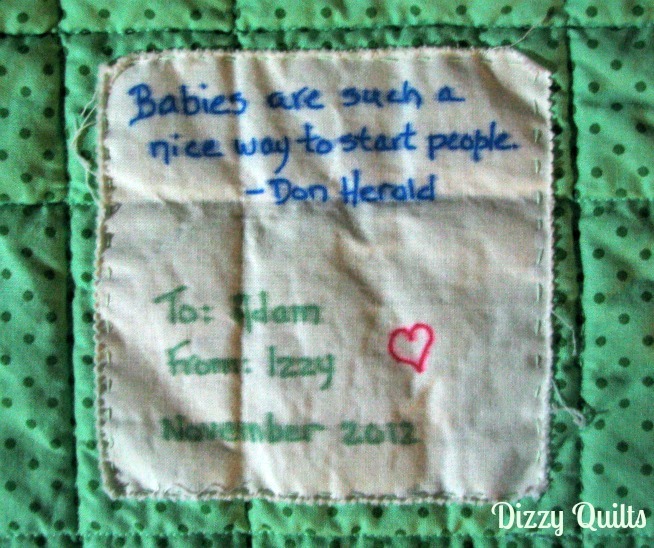 With a bit of luck and not too many interruptions, this baby quilt will be done by the time the baby gets here. I finished Hubble this weekend... And thank goodness I did because it's my wonderful sister-in-law's Christmas present. I really wanted to do some fancy FMQ in the cream background, but I ran out of time so had to go with some simple stitching in the ditch and straight lines. The kitten wanted to pose for this one! I love how this turned out and I know Sandra is going to love it too! Merry Christmas to everyone! I'll be back online in a few days. The recipient of the Morsel I made has finally received it so I can post pictures now! For those of you who don't know, Morsel is a Little Bites pattern by the very talented Carrie Nelson and it also was the December Schnibble in the Another Year of Schnibbles quilt along with the wonderful Sherri and Sinta. 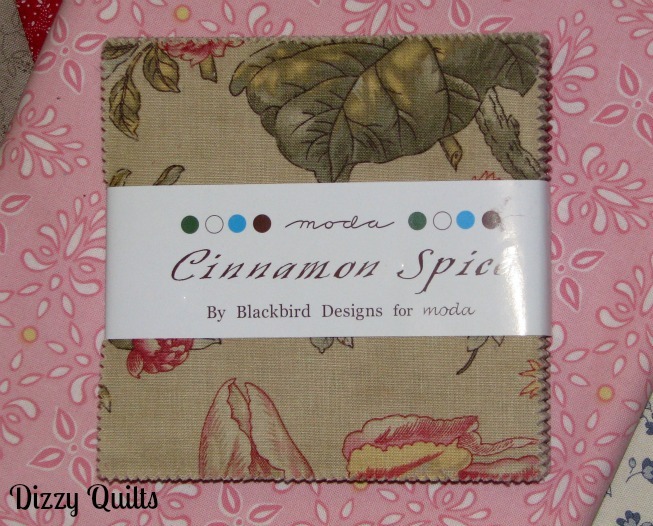 For my Morsel, I chose fabric from the Marmalade collection by Bonnie and Camille for Moda. I really like how it turned out; love the twill tape that came with the pattern! Participating in AYOS has been so much fun. I got so much inspiration from every parade - there are so many wonderful quilters out there, it's unbelievable. 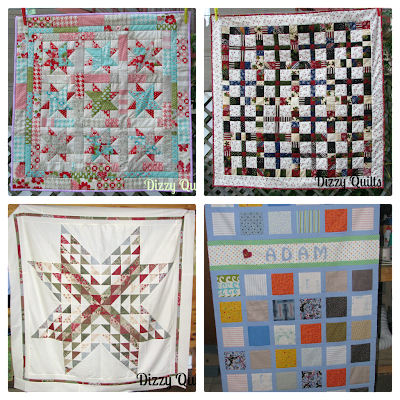 Each pattern was fun to make and I love having all those little quilts around me (most of them are somewhere in the house!). 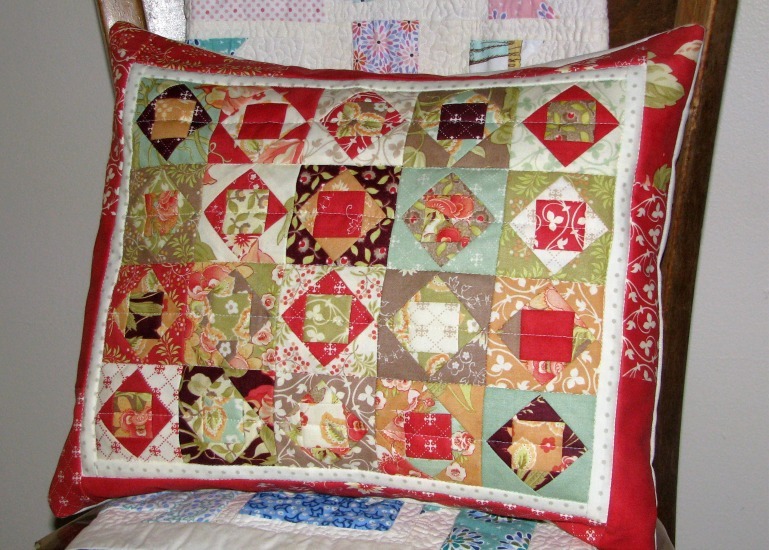 A huge thank you to both Sherri and Sinta for hosting this quilt along... you ladies are great! WIP Wednesday - I'm on a roll! This week, I got lots of stuff done. 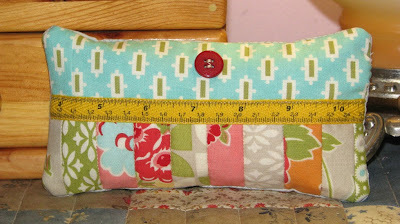 I already blogged about the Drop pillow which was on my to do list for December and posted a picture here. 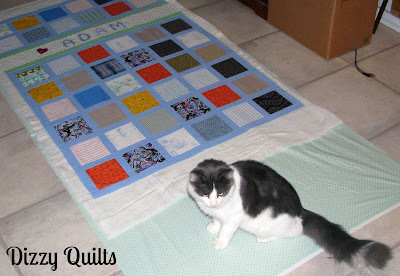 I started quilting Hubble and I'm hoping to be able to finish it this weekend. Another thing on my to do list for December was my nautical 241 tote bag. The pieces were cut a few weeks ago, but I ran out of interfacing so I couldn't finish it. This week, I finally bought what I needed and finished the bag! I decided to use the same fabric for each panel as well as the exterior pockets, but I think I like this pattern better with an accent fabric. So the only thing left on my to do list is the baby quilt for my nephew. I ordered the fabric from the Fat Quarter Shop and it arrived in the mail today. So I'll be cutting fabric tomorrow night! Since all of the items on my to do list for this month were done (or on hold), I decided to get started on a new pillow. I've been wanting to make another Carpenter Star block for a while now so I took out some Sherbet Pips jelly roll strips I got from my friend Karen and got to work. 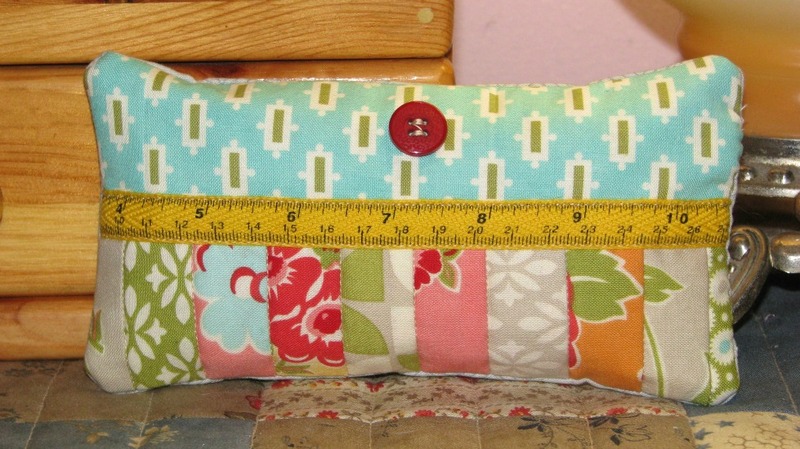 I plan on making a zipper closure for this pillow - my very first try at a zipper on a pillow. We'll see how that goes! And what have you been up to this week? Linking up at Freshly Pieced for WIP Wednesday. 5. Finish the nautical 241 tote bag I started ages ago. Last week, I made the December Schnibble and mailed it to its recipient. I also prepared a backing for Hubble and pin basted the whole thing. Friday night, I got started on the quilting. And yesterday afternoon, I finished number 3 on the list! Yes - that is my Drop pillow! I don't know why I was procrastinating doing this for so long. 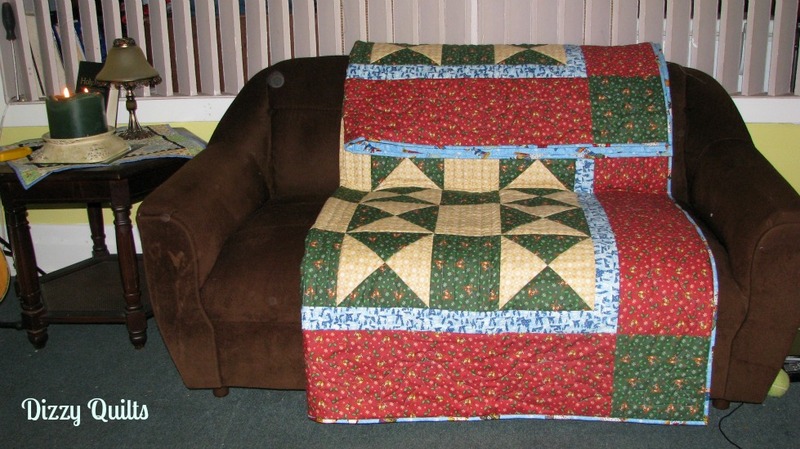 It only took me about one hour to have the whole thing quilted and turned into a pillow cover. For the back, I chose some Lecien fabric I won many moons ago from the Fat Quarter Shop. Next up is my nautical 241 tote bag. I finally bought the interfacing I needed so this should go together very fast. And I ordered some fabric from the Fat Quarter Shop about a week ago for my nephew's quilt so that should come in the mail this week. 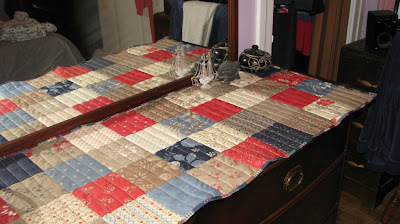 With any luck, the quilt will be finished by Christmas and... my To Do List will be done! And how is your Christmas quilting/gift-making going? 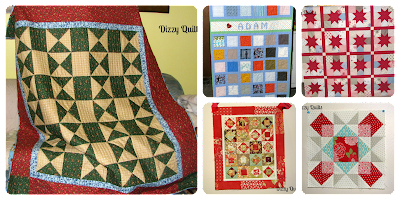 Linking up at Sew Many Ways for Sew Darn Crafty! I worked on a few WIPs this week and I'm super happy to report that I got two of them finished. First of all, I finished all of the table toppers I was making for my bedroom furniture. I shared a picture of the smaller ones last week here. Here is the largest one sitting on top of my dresser. I also finished the December Schnibble called Morsel. But I can't show pictures yet because it's a gift for someone who reads this blog. Karen and I decided to make Morsel for each other as a Christmas exchange if you will and although she knows Morsel is on its way to her, I do want her to have at least the surprise of seeing "in person" which morsel I made and which fabric I chose. 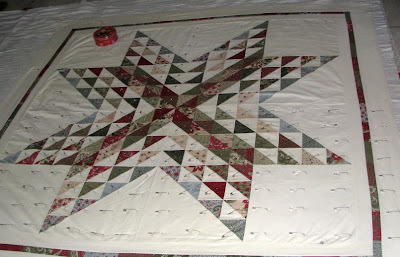 And finally, my project this evening was pin basting Hubble which I plan on quilting this weekend. Pin basting on my hands and knees on the hardwood floor is probably my least favourite thing. My back is killing me now and I'm only halfway done! At the beginning of December, there were 5 things I really wanted to get done before the end of the month. Quilting Hubble is only number 2 on the list! I better get busy! I just popped in to announce the winner of my Sew, Mama, Sew! Giveaway. But before I do, I would like to thank you all for the comments and welcome my new followers. Congratulations Richard! I've email you to get your mailing address. I'll be back soon with pictures of the table toppers I made for my bedroom furniture... All that's left to do is sew on the binding! WIP Wednesday - Too Much Going On! Needless to say, not much sewing got done this week. But I did make progress on the table toppers I'm working on for the furniture in my bedroom. First, I completed the toppers for the night tables. I simply used charm squares and sewed them together. I then quilted straight lines about 1 inch apart. I really like how simple they are. 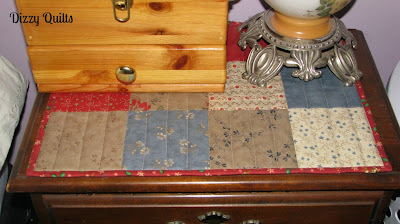 I plan on finishing the top for my dresser and get both quilted over the weekend. And that's pretty much all I've got going at the moment! 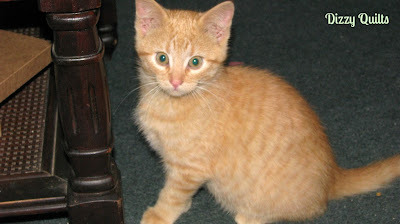 Thought you might enjoy a picture of the new kitty! She doesn't have a name yet, but I'm sure we'll come up with something perfect within the next few days! 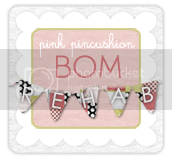 Giveaway Day at Sew, Mama, Sew! 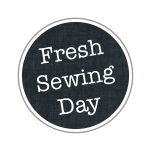 Today is Giveaway Day at Sew, Mama, Sew! And I'm late to the party obviously, but like they say "better late than never!" For those of you new here, I'm Izzy and I'm super happy you came! :-) Please stay a while and look around. So what's up for grabs here today? How can you win this cute little bundle? Leave me a comment telling me what your favourite holiday movie is. Mine is definitely Love Actually... I'm a sucker for romantic comedies starring Hugh Grant! 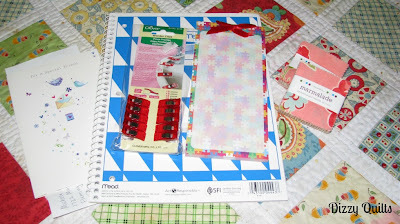 For a 2nd chance to win, be a follower of my blog (or become one) and let me know you are in another comment. The giveaway will be open until December 7 at 8:00 PM (Eastern Time) and I will email the winner no later than Sunday, December 9. The winner will be picked by Mr. Random.org. Oh - and everyone is welcome to participate... I will ship the prize internationally. Have fun with the giveaways everyone! I can hardly believe we are done with November already and that there is only one month left to 2012. November was a wonderful month for me. At the end of October, I got to move into my new sewing room in the city so I was able to get all kinds of good things started in there this month! 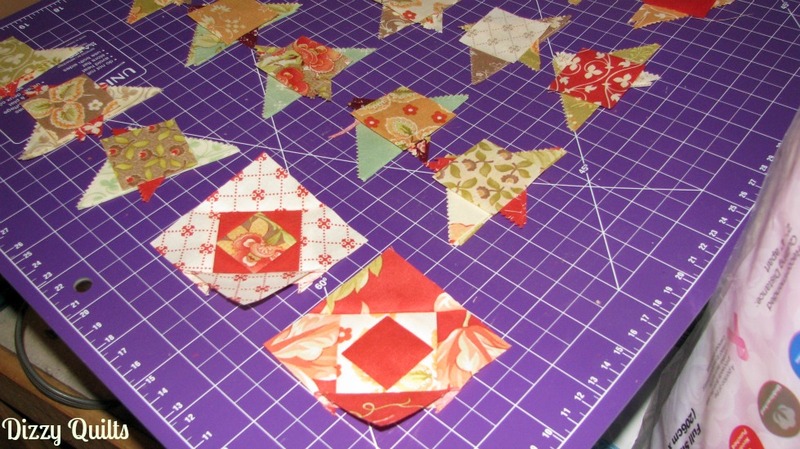 Linking up at Lily's Quilts for Fresh Sewing Day. Michele of Islandlife Quilts was hosting a giveaway a little while ago to celebrate her blog anniversary... And I won! 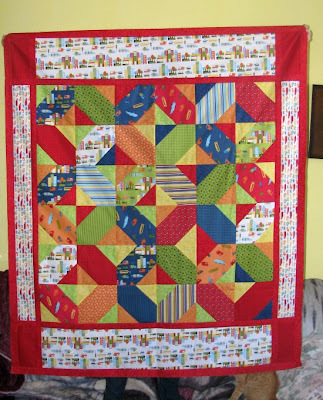 I have been following Michele's blog for a while now and she is a fantastic quilter, a great lady and over the last couple of years, has become a wonderful friend. You really should go check out her blog! I've had the most productive week in a long, long time so I was looking forward to this post! :-) Let's jump right in shall we? First, I made lots of progress on my Charming Stars quilt. All that's left are the inner and outer borders. I found a nice pink fabric I'm thinking of using for the outer border and I'm planning on finishing the top within the next few days. Next, I completed the top for the November Schnibble, Drop. I used Tapestry for this mini quilt and plan on turning it into a pillow as soon as I find the right fabric for the back. 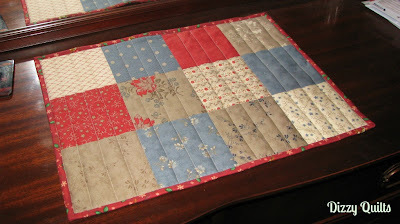 I also completed my first Christmas quilt - Hourglass Patches. You can get all the stats for this quilt on my 2012 Finishes page. 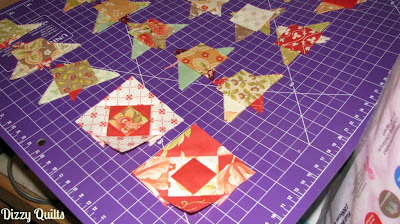 And finally, I started working on those table runners my sweetie asked me to make. I decided to go the super simple and easy way with these - I'm sewing together 5" charms! I chose to work with Independence Trail by Minick & Simpson for Moda. Love the beautiful shades of blue, red and cream. My poor 8 year-old was standing on the couch trying to hold on to both top corners. He was obviously having a hard time! 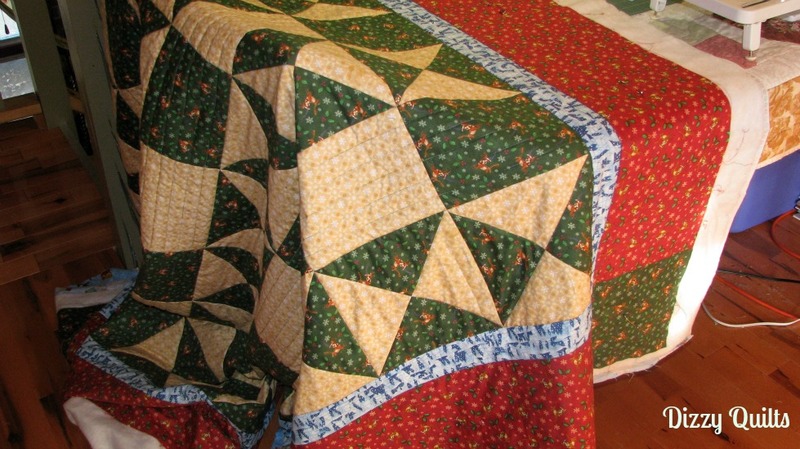 Unfortunately, because I started this quilt soooooo long ago, I can't remember what fabric this is. If you know it, please let me know in the comments. 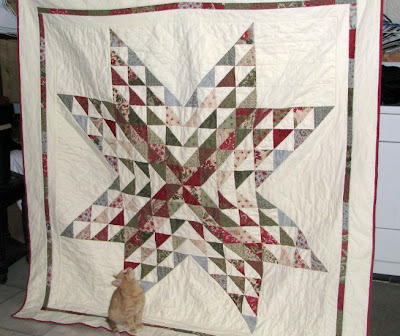 The quilt was designed by Lynette Jensen of Thimbleberries and it finishes at about 70" x 76" - quite perfect for snuggling under. 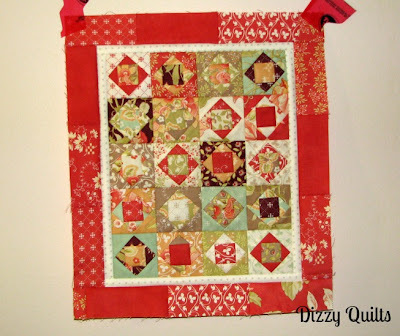 I quilted in the ditch along each block and within the hourglass blocks. 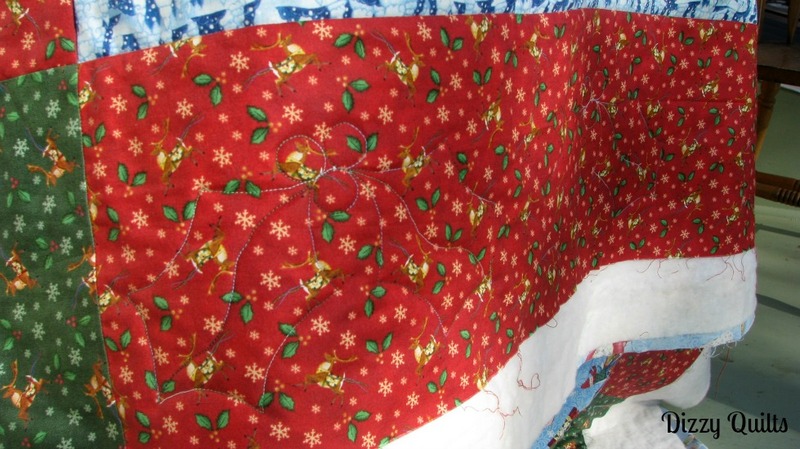 I also quilted straight lines in each of the "patches" and stitched some holly leaves in the red border. I'm super happy with this finish! Here it is on the living room couch, waiting for the holidays to get here. Now if I could just keep the cat and the dog off of it! I finished the November Schnibble tonight! 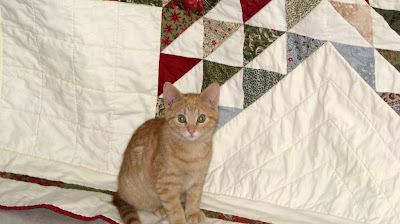 This pattern is another one of Carrie's Little Bites which means the quilt finishes smaller than her regular Schnibbles. For my version of Drop, I picked Tapestry. I really liked the colours of this collection and I happen to have a mini charm pack which I received a couple of months ago from Carrie herself! I'm really sorry about the bad pic... Took it with my iPad and the lighting was really awful. I didn't know what to use for the outer border, but when I came home from work today, I had a nice package waiting for me - the Tapestry charms packs I ordered recently were here! So I cut up 5 of the charms and used those for the border. I couldn't be happier with the results. Now to find the perfect backing for this little quilt... or maybe make a pillow with it! I hope your Monday was fantastic! WIP Wednesday - I'm seeing red stars! Is it just me or does November seem to be flying by? The good news about time flying is that I keep getting closer and closer to my Christmas vacation; the bad news is that I haven't done nearly enough in preparation for this Christmas vacation! 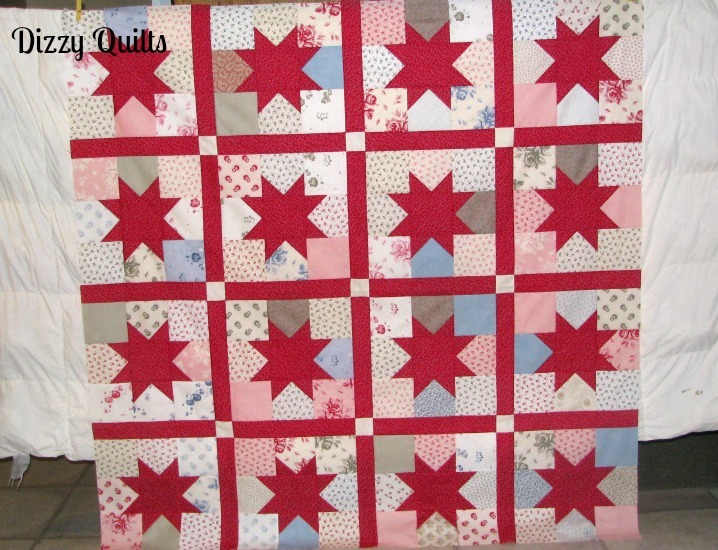 One thing I have done this week is work on my Charming Stars quilt. I was really worried about the red stars and red sashing, but I think it looks awesome! 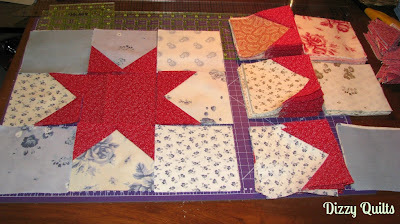 :-) All of the blocks are pieced and turned into rows. 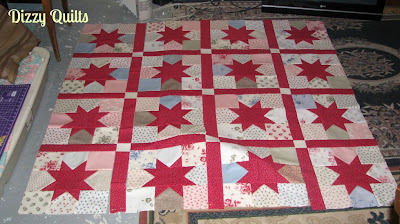 All that's left now is to sew the rows together and add the borders. And I'm determined to have that done in time for next week's WIP Wednesday! I also made the binding for the Christmas quilt I am hoping to finish quilting this weekend. Next week, I really need to get going on Drop, the November Schnibble. I have made no progress on that one in over a week now. - None this week, but I hope to have at least one next week. My first Christmas Quilt is almost done! 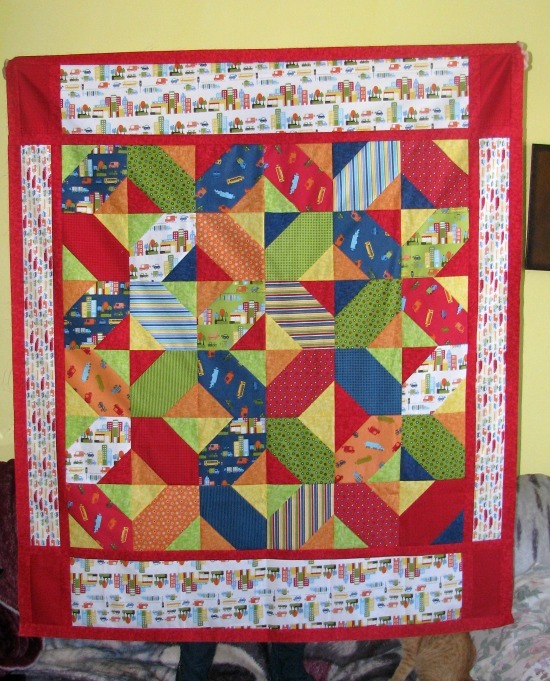 Well, it's not actually my first Christmas quilt, because I made the August Schnibble with Christmas fabric (you can see Dimestore here), but I'm calling it my first Christmas quilt because I started it forever ago. 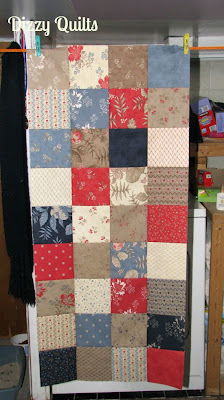 In fact, I finished the top in February 2011. Back when I pieced this top, I even purchased the backing fabric so I didn't even have the excuse of not having the fabric to back it. About 2 weeks ago, I decided it was time. 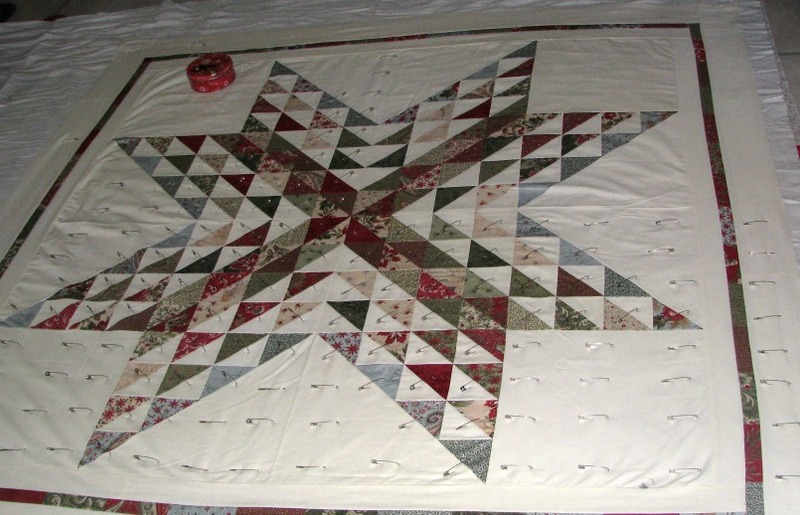 I want this quilt finished for this Christmas. I want this quilt on my living room couch when the Christmas tree goes up the first weekend of December. I did all the stitching in the ditch this weekend. 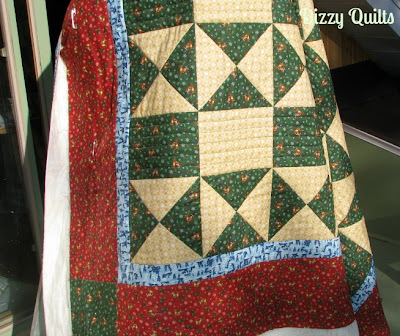 The pattern is called Hourglass Patches and I found it in a book called "Thimbleberries New Collection of Classic Quilts: 28 Quilting Inspirations for the Home". 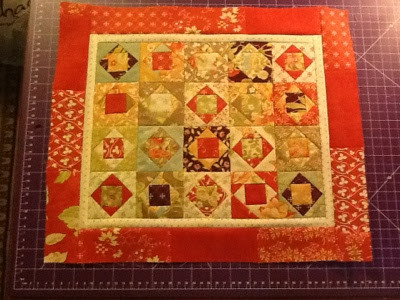 I stitched around each block and along the inner border. And in the outer border, I'm FMQing some holly leaves. With any luck, this quilt will get finished next weekend. So much for more blogging! 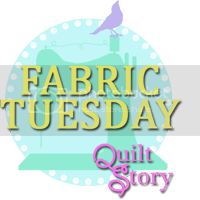 When I got my sewing room in the city, I thought I would be able to blog a little more often because I would get more sewing done. Well... not really. I get to sew a little more often, but with work, the kids and everything else going on around here, blogging hasn't happened quite as often as I wanted. I've made two more blocks since I took that picture so I'm now half way there! The red stars are really growing on me now... 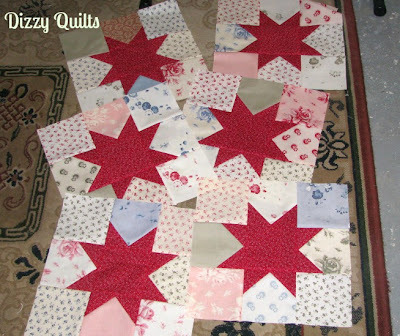 I'm liking them more and more and can't wait to see the whole quilt top done with the red stars and the red sashing. I've also been working on the November Schnibble - Drop. I'm using Tapestry mini charms for this Schnibble. I love the colours in this fabric line. 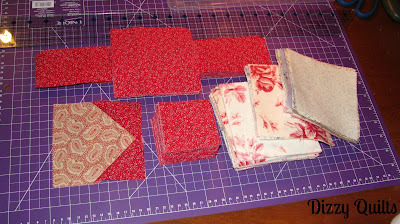 All of the cutting is now done and I started piecing the blocks. I think this mini is going to be perfect as a pillow cover. I love WIP Wednesday! It keeps me focused, it keeps me motivated, it sends me to the sewing room for an hour or so every night instead of just vegging in front of the television. Since my last WIP Wednesday post, I finished a baby quilt (you can see pictures and read all about it here) and I made some serious progress on Charming Stars. I'm done putting all the different parts of the blocks together and now have to choose a layout. I basically have 3 colours in the charm squares I picked for this quilt: reds/pinks, blues and greenish. At this point, I'm not sure if I should put the blocks together by colour or just mix everything. 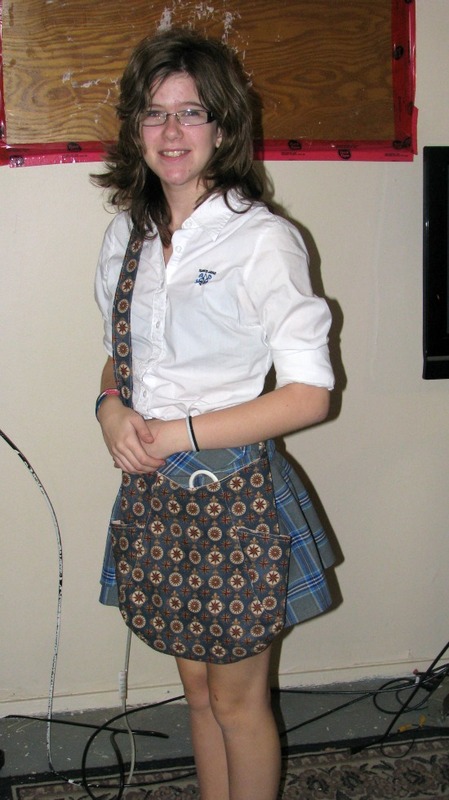 I think I'll have to play around with a few options before I continue sewing. I'm definitely outside of my comfort zone with this bright red as the star and sashing colour, but so far, I'm really liking it. I'm anxious to see how it comes together. 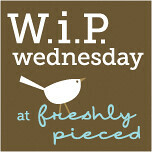 And of course, I'm linking up at Freshly Pieced for WIP Wednesday. I hope you are all having a wonderful week. Adam's Baby Quilt is done! 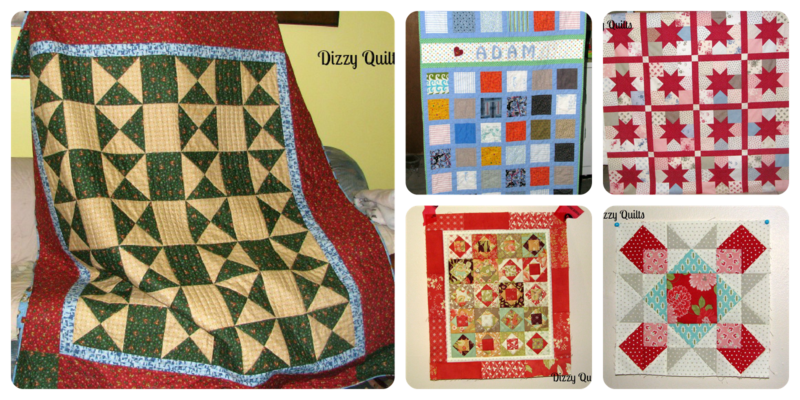 Little Adam will sleep snuggled in his new quilt tomorrow night because I finished it this weekend! Yay! I kept the quilting really simple and went with straight lines along the blue sashing. The backing is a sweet green dot and I used the same fabric for the binding. For the label, I used a 5" square in a solid cream colour and I used green thread to stitch around the outside edge. 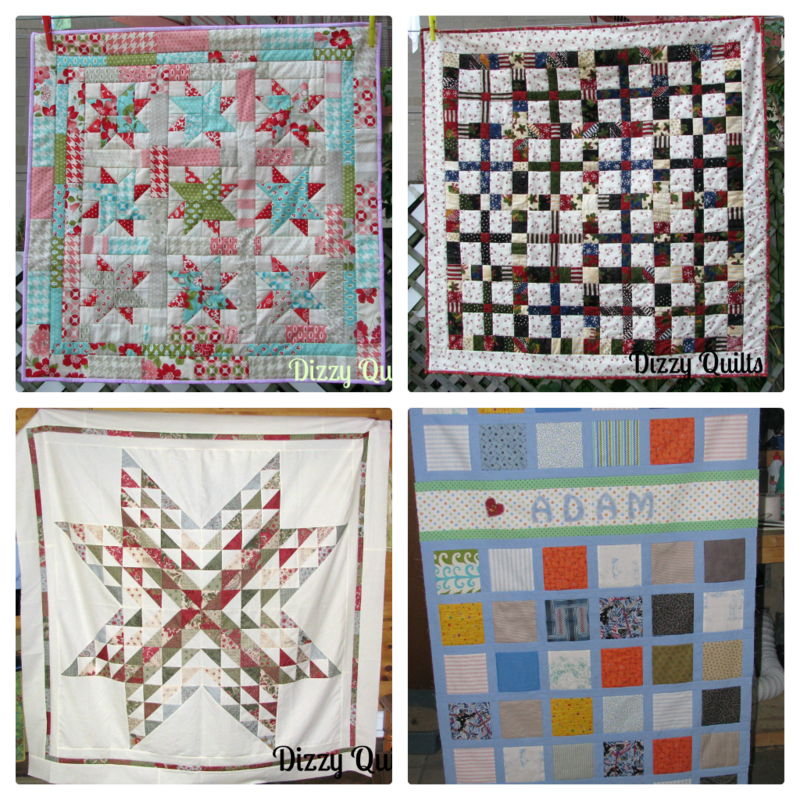 After I finished Adam's quilt, I put together Block 5 of the Fat Quarter Shop 2012 Designer Mystery BOM. 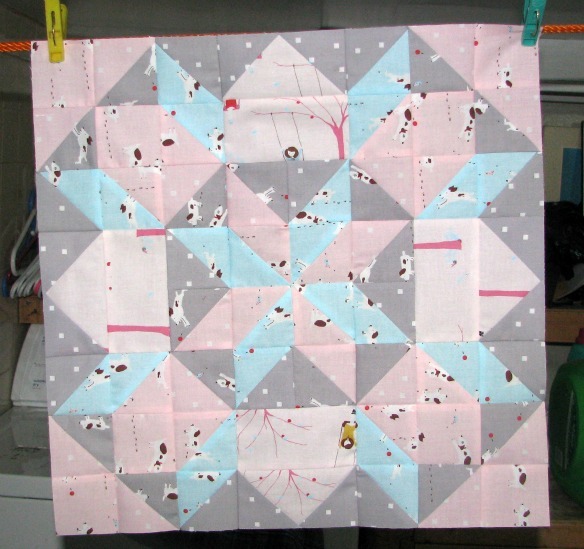 The block is called "Cherry Sundae" and was designed by Barb Adams and Alma Allen of www.Blackbird-Designs.com. When I created my mosaic for October, I realized I completed two projects this month, and finished two quilt tops. Given everything going on around here, those are pretty good results. And how was your month of October? Lots going on here this week... wow - what a difference having a sewing room in the city makes! I've managed to get down there for an hour or so pretty much every night this week, once everyone has gone to bed! 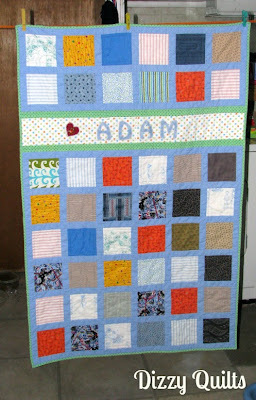 First, I finished Adam's baby quilt top. You can read all about it here. 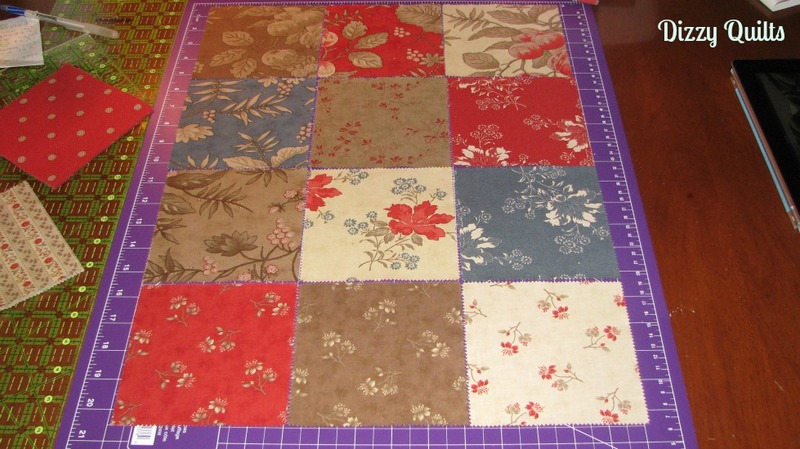 Tonight, I cut and prepared the binding and pin basted it so it is now ready for quilting. Puffs decided he wanted to help prepare the quilt sandwich! This week, I also started two new projects. 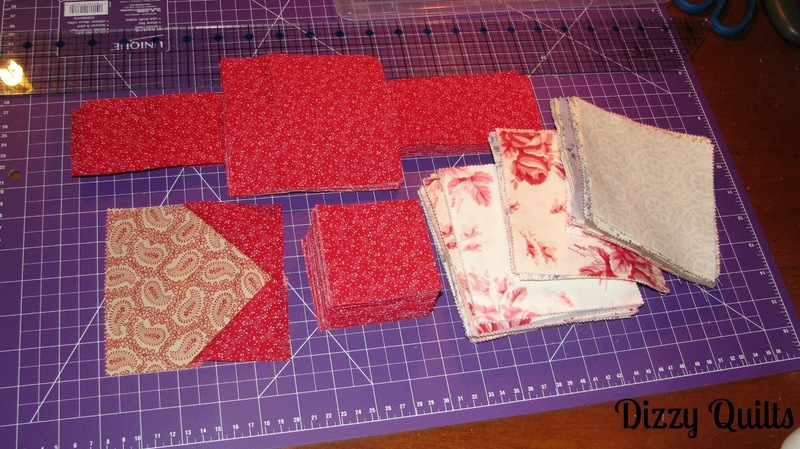 I cut all the fabric and chose the charm squares for a new lap quilt. I found the pattern on the Moda Bakeshop (it's called Charming Stars) and will be using Northcote Range by Cabbages & Roses for Moda for the charms and a red fabric I had in my stash. 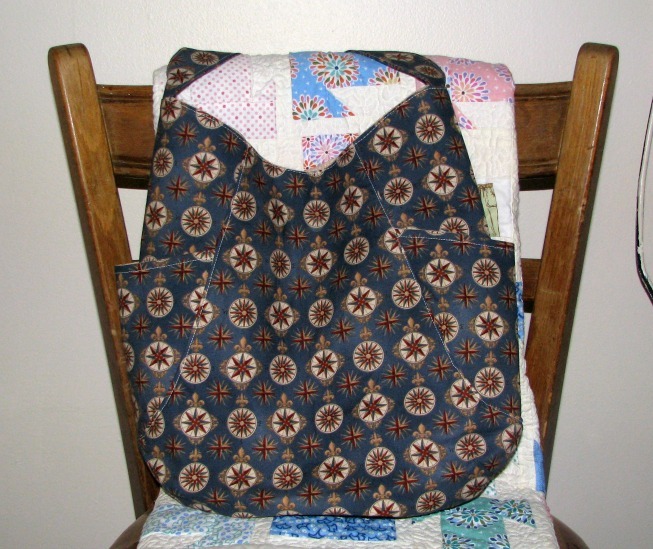 And I finally got started on making more 241 bags so I can give them as Christmas presents this year. 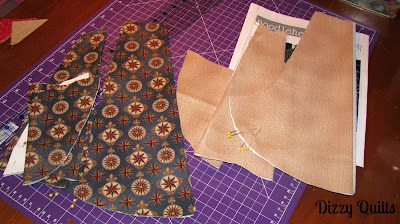 For the first one, I decided to go with a nautical fabric for the outside of the bag and a neutral for the lining. 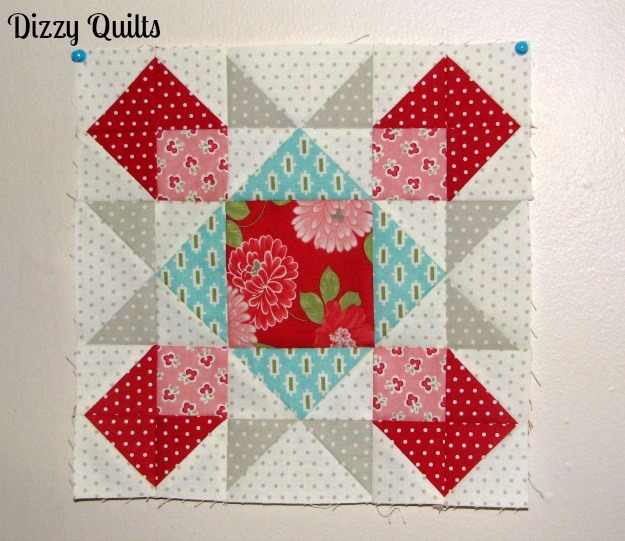 Linking up at Freshly Pieced for WIP Wednesday!